This is my first time participating in the Fall Coffee Lover's Blog Hop. I am not a coffee drinker, but I love hot chocolate so this is my cup of hot chocolate. I used the free digital stamp called called "World's Best Coffee" by From the Heart Stamps. I created the Fall themed background using Distress Oxides. I then die cut the background and stamped Dad onto the corner using Creative Imagination's Narrative set. The cup was colored with Copic markers and popped up with foam tape. Totally delicious card, great background. I am sure dad will be happy with this one. This is perfect! What a great masculine card, I love that background. what a great background for your coffee cup! Fabulous job on your background!! Love the card! Thanks for sharing with all of us!! Welcome to the hop! I love that gorgeous background. The coffee cup is beautifully coloured too! What a fabulous background, Kim. SO nice to see all that work come together so nicely. Great card. I have a stamp set GIVEAWAY on my blog for the Coffee Hop! A lovely oxide background and a perfect Autumnal card for our Allsorts theme this week, many thanks for joining in. Love the gorgeous BG with Masculine feel on it! Awesome masculine card - great background!! Fab masculine card! Awesome background! Love the background and I love the coffee cup and sentiment. 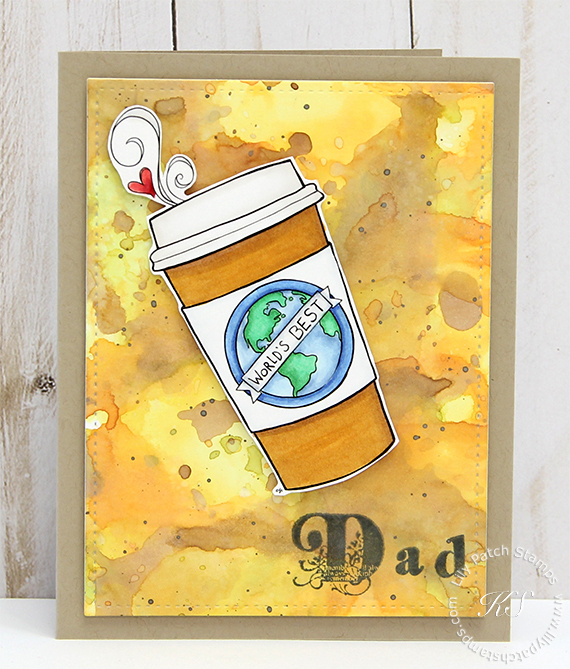 Great masculine card for Dad and love the coffee theme.